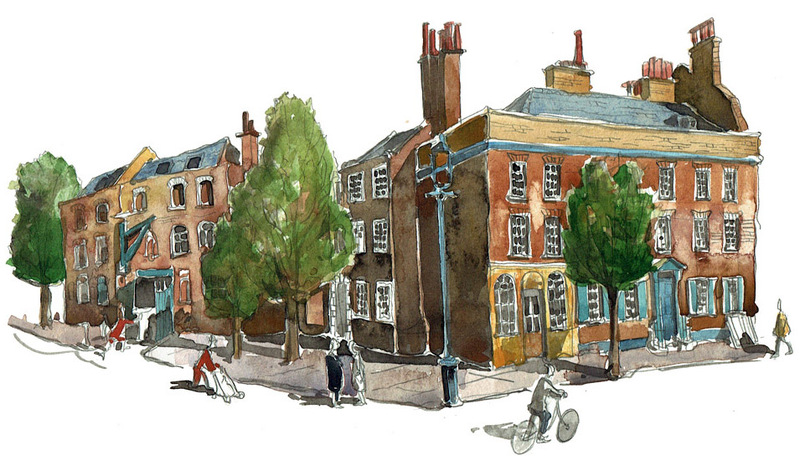 Win a Painting of The Whitechapel Bell Foundry, London. Sign up here. Sign up to my newsletter, and you can enter the free draw to win this original painting worth £110 of The Whitechapel Bell Foundry, London. This watercolour preperation study of The Whitechapel Bell Foundry is 26cm x 15cm, signed and mounted on acid-free card. The newsletter will be sent out on the 27th September 2018. I look forward to your sign up in the box on this page. A bit about the Whitechapel Bell Foundry, London. Established in the Whitechapel area since 1570, this company has produced some of the world’s most famous bells including Big Ben, the original Liberty Bell and the Peal of Bells which rang on the Herald Barge for the Queen’s Diamond Jubilee River Pageant. They are also made one of our bells here in Pilton where I live. Sadly, the foundry closed in May 2017, after nearly 450 years of bell making and 250 years at its Whitechapel site, with the final bell cast given to the Museum of London along with other artefacts used in the manufacturing process. The latest I have heard is that it may cast bells again at some point and/or be a posh hotel. Time will tell. That is so interesting to know about this foundry, and yet so sad that they closed. I would love to visit – and see your paintings. Thank you for sharing!